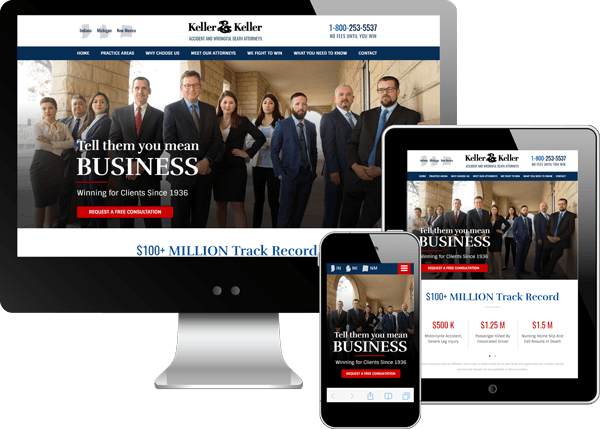 Keller & Keller Law, also known as 2Keller, partnered with Foster Web Marketing in 2007. When we first started working with the multi-state law firm, it had one main website for Indiana, and two subdomains for its New Mexico and Michigan offices. This was working all right for the Kellers, but we knew we could provide them with awesome SEO benefits and an easier, concise marketing plan. What we did: Initially, our team—in consultation with the Kellers—decided to keep the three websites separate. Because the law firm practices some of the same types of law and some different types of law in each state, the firm's partners were concerned that users would not be able to identify which services are offered in each state. Their concerns were completely legitimate, but we knew there was a way to make everything work together on one site, and make it successful. After much coaxing, we convinced 2Keller to let us combine the websites, and the results have been fantastic. Why does it work? By merging their sites, 2Keller only has to market one site, which makes life much easier for its team. The SEO benefits are also critical—having more than one website for your business means you are actually competing against yourself for search engine rankings! One of our challenges was making the content for each practice area in each state different enough that it doesn’t get counted as duplicate content. We were able to work with the Kellers to identify and highlight important differences between the offices, and this ability to differentiate the content is earning awesome results in search engine rankings. What we did: If you do a quick search for “How much is my semi-truck accident worth?” you will find 2Keller’s website is one of the first results on the front page of Google. You’ll also find them in the same spot for the search query “Harley wobble” (a common issue for Harley Davidson motorcycle riders). That’s a pretty good spot to find your business! To capitalize on this, the team at 2Keller had specialty pages designed to provide concise, easy-to-digest information. Why does it work? These specialized pages not only provide answers to frequently asked questions, but they let users get an idea of how strong their case is—an awesome feature unique to 2Keller’s website. For many people facing legal battles, the strength of their case can be a major point of concern. 2Keller provides information about past cases, responses from Harley Davidson and major trucking companies, guidelines for interpreting legalese, tips for users to protect themselves, and messages that encourage users to communicate with the legal team and other people experiencing similar issues! Some interesting facts: We feel that 2Keller falls into the “perfect client” category because they understand that marketing is not something you can "set and forget," so they are proactive about learning. The team at 2Keller sends their marketing team to the very same SEO and marketing conferences we’re sending our team to! We can make an incredible website that is well optimized, promoted, and bringing in business. However, knowing why it’s working is the key to keeping it awesome, and 2Keller does just that.